Your Nonprofit's Audience is King! In the world of integrated marketing, many of us have heard the mantra, “know your audience.” The audience (your current market) may not be the new black, but it is the quiet King. It should be the focal point of everything related to your strategic planning, reporting and creative and messaging development. We are in a world where retention is a primary focus because many of our donors aren’t being emotional involved or moved enough to stay. Controls and one size fits all approaches are boring them. So often we lose sight of our current market and undervalue them by not considering who they are and what their needs may be. Many organizations approach creative packages as an instrument to increase response and only later home in on their segmentation strategies. A trap many of us have fallen into is believing that our messages are relevant to everyone – they’re not. Every relationship matures and evolves over time and so should your relationships with your supporters. This is the first article in a 3-part series in which I’m going to discuss how to build a multi-channel, integrated high value donor management program. Let’s start with No. 1: How to properly identify groupings of audiences that are segment-able within most systems. We'll start by using one simple goal as our guide: Increase retention of high value current market audiences. Current market audiences are those supporters and donors that have already opted in to hear from your organization. They have either donated recently, opted in to received emails from you recently, are an active volunteer or are active readers of your emails and newsletters. In this first step, our ultimate objective is to separate our constituents by behavior level and then learn some basic psychographic and demographic information about each. From there we can begin to identify motivations by segment and plan strategies to better cultivate them. 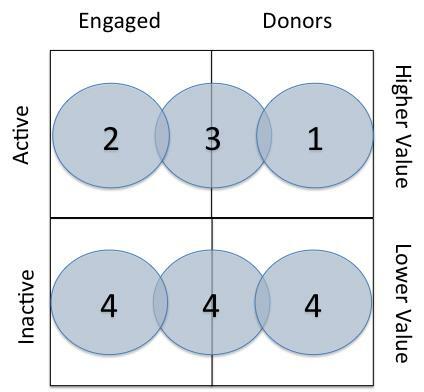 Segments 1 and 3 have a dollar value that can be assigned to them, as they are both donors. Segment 2 is a not donor, but has potential dollar value as they may be an active email subscriber, or a political or social advocate and just have not yet donated. Segments 1, 2 and 3 are your current market. Segment 4 are 13+ month inactive and but hold potential future value to the organization using re-engagement strategies.